As living in the bush also means isolation from medical services, it is critical that basic steps are taken to maintain good health. Medical support can be offered by village medical centres, staffed by volunteers in smaller villages. Access to doctors usually means a flight out to a local hub 'city', or to a larger city for more serious interventions, provided there are planes flying. Some villages have doctors visiting on rotations. Sickness can spread quickly within the confines of a school. Care is taken to keep hands washed throughout the day. Many of the students suffer from poor nutrition, and lowered immune systems caused by stress, can be just the invitation needed for illness to spread. This all means that routine visits to doctors while out of the bush, help manage good health and help avoid medical emergencies. Dentistry set up in the school. Education about dental care is a priority. 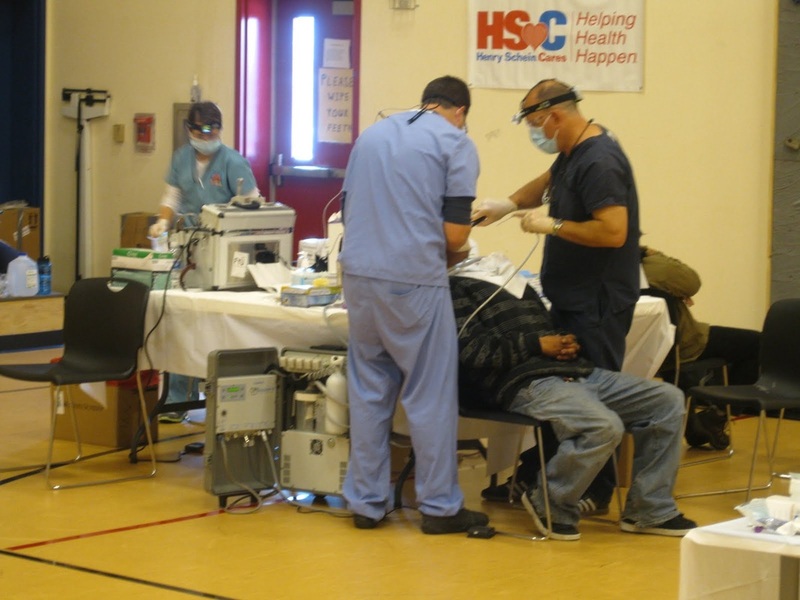 Dental care is also available with surgeries set up in classrooms or the gymnasium as pictured. Dental hygiene has become a major concern since the introduction of sugared foods not normally part of the traditional diet. This means that children suffer from dental decay. Many teachers have toothbrushes in the classroom for daily teeth cleaning rituals after meals, and teach about importance of dental hygiene. For teachers, the lack of fresh fruit and vegetables is often counteracted with vitamin supplements. Being exposed to potential water pollutants, and new bugs, means being conscious of the need to get enough rest and relaxation during the long teaching and often subsequent coaching hours of the school calendar. Most villagers use the school gymnasium for a variety of sports and keeping fit regimes over the long winter months. 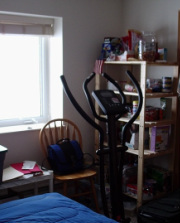 Often involved with coaching, teachers sometimes use gym equipment in their apartments for personal fitness,especially when time is limited and venturing outdoors in freezing temperatures is prohibitive. A black hawk helicopter on a urgent medical mission. A well organised village medical centre. 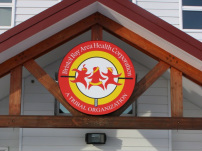 Health aides, nurses provide day to day care. Doctors visit periodically. 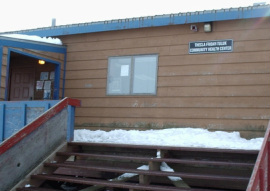 A native hospital in Dillingham, SW Alaska. Native Youth Olympics: This athlete must keep one hand on the mat and bat the ball that is just out of reach, returning to the same stable position. Basketball is very popular throughout the winter months for students as well as adult teams. Many of the children know the value of fitness and see adults engaging in sports. The native Alaskans are competitive in team sports and highly value the status their village accomplishments may achieve on the sporting calendar. 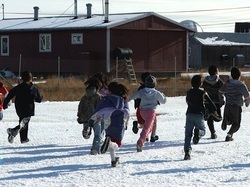 Some villages have cross country training on the tundra during the summer months. 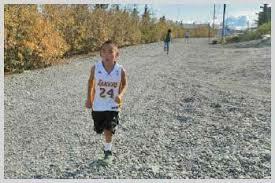 The tundra is spongy rather like running on sand hills, and can quickly develop strength and durability.